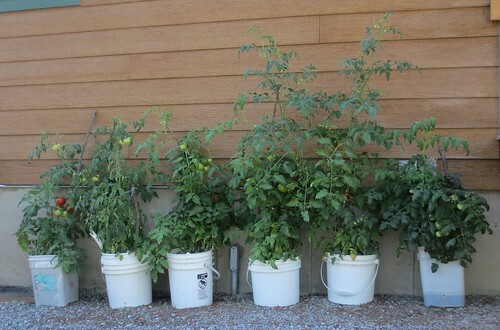 Here is a photo of some of my tomato container gardening this year. These plants have been growing in recycled plastic buckets for the last several months. I am just now able to start harvesting red tomatoes. As you can see I have a few more red tomatoes and many green ones still growing. I have reused these same buckets for many years now. I am able to buy them at my local grocery bakery for just a dollar. They are food-grade buckets that frostings, fruit-fillings and other bakery supplies are sold in. They make excellent containers for growing tomatoes and other items if you don’t have a lot of room to put in a traditional garden. Most of these buckets just have holes drilled into the bottom for drainage. 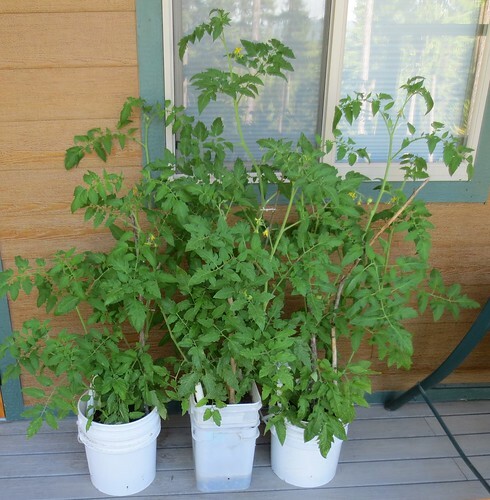 I also have a few self-watering buckets that I made using this self-watering tomato plant container tutorial. Here is one of my self-watering containers below. Here are my tomato plants that I am growing in my self-watering containers. I made these containers a few years ago and just reuse them each year. I did have to replace the tin water cans in the bottom of the buckets this year but other than that these can be used year after year. Self-watering plant containers work well as the water is sucked up through the wicking can directly to the roots of your plants. Additionally you don’t have to water your plants every day as you have a reservoir of water inside the outside bucket for your plants to draw from. All you need to make a self-watering plant container such as mine are two recycled plastic buckets, a tin can, and a piece of plastic tube or pipe. I used Urban Organic Gardener’s post and video to help me assemble my self-watering containers.